Product prices and availability are accurate as of 2019-02-23 18:18:06 EST and are subject to change. Any price and availability information displayed on http://www.amazon.com/ at the time of purchase will apply to the purchase of this product. The Pressure Compensating 1/2" Shower Adapter 1.75gpm is a cost effective solutions to replacing the existing showerhead. 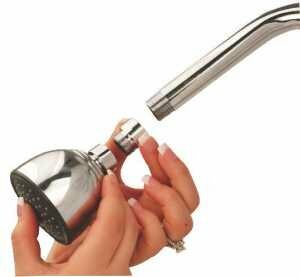 Simply install the adapter between the showerhead and shower arm to deliver a more economical water stream. se this shower flow control valve to reduce the flow to 1.75 gallons per minute (gpm). Chrome plated solid brass. Pressure compensating to work with a variety of water pressures.